Average earnings could be depressed for years, making them a less-useful tool in signaling a tightening of the labor market. Janet Yellen (AP photo/Cliff Owen). 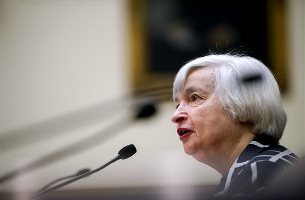 (Bloomberg) — Federal Reserve Chair Janet Yellen’s focus on wages to help gauge the strength of the job market could need fine tuning as baby boomers approach the twilight of their careers and millennials jump in to fill the void. As today’s middle-aged Americans grow older, they are leaving their prime working years behind, trading big salaries for part-time gigs or retirement, just as an even larger group of young people come into the labor force at entry-level salaries. The seismic shift may be one reason behind the sub-parwage growth that Yellen says still shows “significant slack” in the job market. As the labor pool becomes weighted toward these age extremes, average earnings could be depressed for years, making them a less-useful tool in signaling a tightening of the labor market. A similar dynamic is influencing the unemployment rate, which is dropping faster than central bankers predicted in part because of the retirement of baby boomers. Rapid improvement in the labor market would prompt the Fed to raise interest rates sooner to prevent inflation from rising too much, while slower employment gains would keep rates low for longer. Fed officials currently anticipate raising their benchmark interest rate from almost zero sometime next year, according to projections released in June. Boomers, the more than 76 million people born between 1946 and 1964, began turning 65 three years ago and all will have reached that age by 2030. All millennials, the 82 million people born between 1981 and 2000, will have entered prime-working years — the age group from 25 to 55 — by the end of 2025. The group sandwiched in between, Generation X, is just 57 million people strong. The result: 25- to 34-year-olds will make up 22.5 percent of the workforce by 2022, compared with 21.6 percent in 2012, the Bureau of Labor Statistics estimates. The share of America’s oldest employees, those over 55, will expand even faster — to 25.6 percent from 20.9 percent and led by people 65 and older. Meanwhile, the share of 45- to 54-year-olds in their best earning years will drop by 3.3 percentage points in the decade ending 2022. That age group shrank in 2010 for the first time since 1983, and has contracted each year since. Hollowing out the middle-aged working population could cut median earnings because such employees bring home the biggest paychecks. The median 45- to 54-year-old household earns $66,400 a year, compared with $51,400 for 25- to 34-year-old households and $33,800 for those 65 and older, according to data from the Census Bureau. Full-time middle-aged earners made a median $898 per week in the first quarter, Bureau of Labor Statistics data show. Workers older than 65 earned $809 and those between 25 and 34 made just $727. Homer Wong, 57, and Zackary Hargett, 22, are in the thick of the generational shifts that will influence economic data over the next decade. Wong, who lives in Redwood City, California, is returning to work at Hewlett-Packard Co. after taking an early retirement package from the world’s second-biggest personal computer maker when he was 50. He worked at a credit union after leaving his job as HP’s director of strategic alliances, and will earn less in the executive development and coaching role he starts Aug. 1 than he made seven years ago. Wong’s outlook is typical of older workers, said Martha Deevy, director of the financial security division at Stanford University’s Center on Longevity near Palo Alto, California. Hargett, meantime, started a job last week at EY, the consulting firm formerly known as Ernst & Young LLP, after graduating from the University of North Carolina at Chapel Hill in May. Hourly earnings for production workers have increased 2.1 percent year-over-year on average since the recession ended in June 2009, compared with 3.1 percent in the previous expansion. Last month, earnings were up 2.3 percent from a year ago. Yellen referred to the “slow pace of growth” in measures of hourly compensation in remarks to a Senate committee last week as a sign of “significant slack” in labor markets. Stone, a former a researcher at the Federal Reserve Bank of New York and chief financial economist at Merrill Lynch, said his favorite pay measure is buried at the end of the monthly jobs report, table B-9. It’s an index that takes into account average hourly earnings, the length of the workweek and employment. The measure increased 4.6 percent in the 12 months through June, exceeding the 2.9 percent average in the current expansion and the 3.8 percent gain in the prior one. “The average hourly earnings only tells part of the story, and this tells a more robust story,” said Stone, who has testified before Congress on the conduct of monetary policy, and has served as an adviser to the U.S. Department of Commerce on improving economic statistics. He said Yellen probably looks at multiple wage indicators and this should be at the top of the list because it “helps to skirt” the demographic issue. The demographic changes should transform into an earnings booster in the future, said the Urban Institute’s Nichols. The impact of the demographic shift could be lessened — or even eliminated — if boomer retirements lead to shortages. Such labor-market tightening would force companies to pay up, said Gad Levanon, director of macroeconomic research at the Conference Board in New York. Nonetheless, Americans are delaying retirement, which could prolong wage drag in the short run because older workers earn less. Half of workers will wait until after age 65 to retire, up from 34 percent in 2011, according to a 2013 Towers Watson & Co. survey of more than 4,000 retirement-plan participants working full-time. Almost a quarter planned to retire after 70, up from 10 percent in 2011.